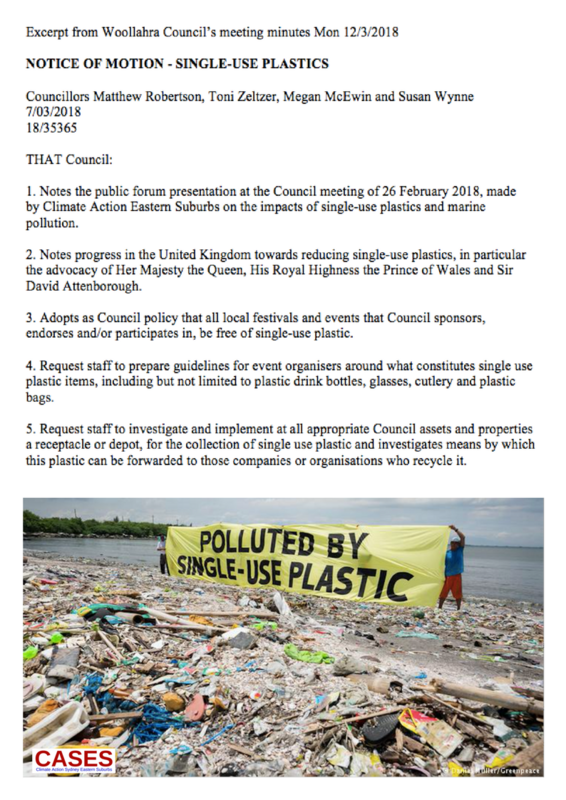 The propsal from CASES to Woollahra Council (26-2-2018) that all local festivals and events that Woollahra Council sponsors, endorses and/or participates in, be free of single-use plastic. Was put up as a notice of motion by Councillors Matthew Robertson (Greens), Toni Zeltzer (Liberal fmr Mayor), Megan McEwin (Greens) and Susan Wynne (Liberal fmr Residents First) and given unanimous support by the whole of Council (12-3-2018). 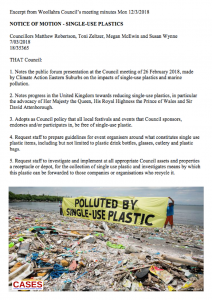 This entry was posted in Banning single use plastic, CASES Events, Climate Change News, Resources and tagged CASES, Climate Action Sydney Eastern Suburbs, single use plastic, Woollahra council. Bookmark the permalink.